1838 map of Victoria and New South Wales showing towns, major rivers and the limits of the Colony at the time. The map shows in red the routes taken by Mitchell's expedition and camps. For other uses, see Thomas Mitchell (disambiguation). Major Sir Thomas Livingston Mitchell (June 16, 1792-1855), surveyor and explorer of south-eastern Australia, was born at Grangemouth in Stirlingshire, Scotland. He was educated at the University of Edinburgh, but the poverty of his family following his father's death led him to join the Army in 1811. He saw service in Portugal, where Sir George Murray, later to be Colonial Secretary, was the Army's Quartermaster-General, and became Mitchell's most important connection. He learned surveying in the Army, and in 1817 he married Mary Blunt in Lisbon. When the Napoleonic Wars ended in 1815 Mitchell returned to the dull routine of peacetime soldiering, and in 1827 he was pleased to take up the position of Surveyor-General of New South Wales. In this post he did much to improve the quality and accuracy of surveying - a vital task in a colony where huge tracts of land were being opened up and sold to new settlers. One of the first roads surveyed under his leadership was the Great North Road, built by convict labour between 1826 and 1836 linking Sydney to the Hunter Valley. Mitchell undertook four journeys of exploration in the interior of New South Wales. In 1831 he explored the river systems to the north-west of Sydney. Mitchell believed that all these rivers flowed eventually into the Darling River, which Charles Sturt had discovered in 1829. He travelled as far north as the Gwydir River near the site of Moree and the Barwon River near Mungindi. But his supplies ran low and when Aboriginal people killed two men in a back-up party bringing further supplies, he decided to turn back to Sydney. On his second expedition, in 1835, Mitchell travelled north-west up the Bogan River to its confluence with the Darling, then travelled about 500 km down the Darling. In this way he proved that all the westward-flowing rivers in New South Wales flowed into the Darling. He planned to trace the course of the Darling River to the sea, but harsh conditions and more fighting with the Aboriginal people of the riverlands forced him to turn back. In 1836 Mitchell embarked in his third and most important journey. He followed the Lachlan River to its juncture with the Murrumbidgee River, then followed the Murrumbidgee to its confluence with the Murray River. His orders were to follow the Murray to its mouth, but instead he went east up the Murray to a point near the present-day site of Kerang, then turned south into what is now Victoria. He followed a route to the west of that followed by the Hume and Hovell expedition of 1824. In this way Mitchell was the first European to discover and map the Western District of Victoria and the Grampian Ranges. Across the mountains, Mitchell found some of the richest grazing land in the world, which would soon support the world's most prosperous woolgrowers. He called this country "Australia Felix" - Fortunate Australia. Finding the Glenelg River and rowing down it, Mitchell's party reached the sea at Portland Bay, on Bass Strait, on 29 August. Here Mitchell was astonished to meet a party of settlers, the Henty brothers, who had crossed from Van Diemen's Land and established a sheep run there in 1834. The Hentys were settled illegally - they were the founders of the Victorian squatter class. After recuperating for some time at Portland, Mitchell returned to Sydney via a more easterly route, crossing the Broken River near the site of Benalla. On his return to Sydney with the news that he had discovered a huge expanse of superb farming country, Mitchell was knighted. For many years the road south-west into the Western District was called the Major's Track. 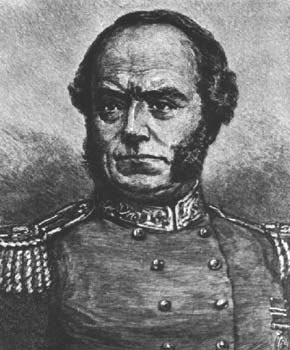 Mitchell's fourth and last expedition, in 1845-1846, took him north from Sydney into what is now Queensland. Here he became the first European to discover and name the Balonne, Culgoa, Barcoo and Belyando rivers, which mostly flowed south-west into the Darling. This area was not as rich as the land he had found in Victoria, but in the future it would prove to be excellent grazing country. In retirement Mitchell published the journals of his expeditions, which have proved a rich source for historians and anthropologists, with their close and sympathetic observations of the Aboriginal peoples he had encountered. These publications made him the most celebrated Australian explorer of his day. But he was a famously difficult man to get on with. In 1850 Governor Charles Augustus FitzRoy wrote: "It is notorious that Sir Thomas Mitchell's unfortunate impracticability of temper and spirit of opposition of those in authority over him misled him into frequent collision with my predecessors." Mitchell died in Sydney in October 1855. A newspaper of the day commented: "For a period of twenty-eight years Sir Thomas Mitchell had served the Colony, much of that service having been exceedingly arduous and difficult. Among the early explorers of Australia his name will occupy an honoured place in the estimation of posterity." Among other ways, Mitchell is commemorated by town of Mitchell in Queensland, the electorate of Mitchell, and in the name of Mitchell College in Wodonga, Victoria. The Major Mitchell's Cockatoo is named in his honour. Mitchell is also the namesake in the highest honour of the NSW Surveyors Awards, the Sir Thomas Mitchell Excellence in Surveying Award.